One of the best things about Racebets is that it offers a mobile version that existing players can check whenever they use their Android phone. As the platform does not have a dedicated Android app, there is no way that you can find a Racebets app in the Play Store or Google Play. It does not mean though that you’ll not be able to use Racebets in our Android. Racebets has a unique mobile-optimised website that you can use when you are outside and would still want to check on the bets. To do this, you have to create a bookmark on your device to quickly access the mobile-friendly website version of Racebets. You may also install the web app which allows you to promptly redirected to the mobile version of the Racebets betting platform. One of the things about the Android web app of the Racebets platform is that it prompts you to configure some settings before you can use it. First, you need to click on the “Apps” label and then “Settings”. After that, click on the “Security” button and check the “Unknown Sources” box. It will allow you to install the web app for Android. Check out some of the screenshots to get an idea as to what the Android version looks like. Although Racebets does not have a dedicated app, the mobile optimised website does have its own set of cool features that it can offer to the players. First of all, it provides a slide movement feature that most modern and interactive websites offer these days. With this feature, you have to swipe left to see the options. The mobile site is also very organised and is also very appealing visually because of its warm colours. 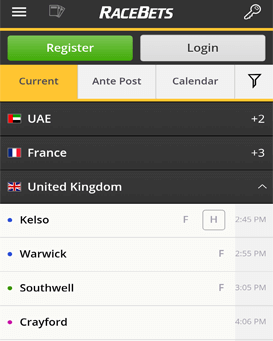 As for its possibilities, there are three main tabs there being the Current tab which shows races happening now, the Ante-post tab which shows finished races, and the Calendar which shows a list of events that are to occur. There are also some tabs that allow you to register to the Racebets platform and there are also some sign in options that will enable you to sign in if you already have an existing account with the platform. Other options include the highlights option which allows you to see the highlights of the races, the live streaming options, head to head races, and the next races. Just like the Android version of Racebets, there is no dedicated app for iOS devices that can found in the Apple Store of iPhones and Ipads. So, by downloading the web app for iOS devices, you can be redirected right away to the mobile-optimised website where you can start playing and placing bets on potential opportunities. The Racebets iOS mobile app is precisely the same as the one that will be used by Android users as it is just the mobile website. All of the options that can be found by the Android users can also be seen by the iOS users when you would boot up the mobile Racebets platform in your iPhone or Ipad. The only difference between the Android version of the web app and the iOS version would be that iOS users will not have to configure any security settings anymore. iPhone or Ipad users can install the web app, boot it up, be redirected to the primary mobile website page and then sign in. As stated in the two previous sections, there are no dedicated apps for both the Android and the iOS devices which means that users of both these devices would have to rely on the mobile site version. Aside from downloading the web app that redirects to the mobile site version, you may also enter the link of the mobile version which is m.racebets.com. This website will allow you to access the mobile website on your phone when you boot up a browser. All of the features and options that were mentioned above in the sections of the Android and the iOS are all the same as in this section as the mobile version of the website is the same for all smartphone and tablet users. As for any mobile Racebets bonuses that offered to those who register with their Android, iOS, or other mobile devices, Racebets offers a free £50 bet upon registration. The steps are just to register a new account with the Racebets platform if you are not a member yet. Once you have completed the whole process of registering, you have to place your first bet. Take note that your first deposit must be a minimum of £10 for you to get the bonus. Once you have already set your first bet, then you should enter the bonus code WELCOME that will enable you to get the bonus of £50 worth of free bets. You must take note only one person per account may get this bonus and abuse of the offer may lead to action taken by Racebets management. Also, this bonus can’t be in conjunction with any other bonuses that Racebets will be giving out while you are playing or placing bets. To qualify for the bonus, you need to have a minimum deposit of £10. Deposits through Skrill, PaySafe, and Neteller are not qualified except for players in India. Maximum bonus that can be claimed is £50. To use your bonus, bet with your qualifying deposit and enter the bonus code in the bonus section of the website to activate. The welcome bonus is only valid for 45 days after registration. Withdrawal entails a rollover of the welcome bonus cash five times. Only players from Austria, Finland, Germany, India, Ireland, Malta, Mauritius, Norway, Sweden, Switzerland, and the UK are qualified to partake of the welcome bonus. This bonus is only valid for one person per account. This bonus cannot be used along with other welcome bonuses offered by Racebets. Bets with odds less than 1.5 are not included in the rollover requirement. Customers are limited to one account per person, per family, per address, per email address, per telephone number, and payment details. If there is evidence of a breach in the terms and conditions of the said promo or any other activity in the platform, Racebets may hold any bonuses supposedly given to the guilty party and may declare the bonus as invalid. Racebets may also have the right to charge penalty fees that equal to the full deposit bonus or the exact amount of the promotion plus additional payments for covering administration costs. Racebets reserves the right to demand any documentation from its customers for verification purposes before crediting any bonus amount. Should the documents prove to be insufficient or invalid, Racebets reserves the right to hold any bonus or declare them void. Racebets reserves the right to refuse any bonuses or service if a player violates the terms and conditions. For system compatibility and requirements, there are no system requirements needed for the app as it is just the mobile version of the website that can be accessed by the users of Androids, iOS devices or other smartphones. For Android users, there are no requirements needed for the device to access the web app. However, you may need to configure the security settings of your phone to allow the downloading of the web app since Android phones do not support betting apps. To know how to do this, refer to the instructions given above in the section about Racebets for Android. For iOS devices, there are no specific requirements or system compatibility issues that need to be taken into consideration since there is no dedicated app for iOS devices. People who use other devices may also access the Racebets platform provided that they have an internet connection and a working internet browser. They may simply enter the link of the mobile version of the website which is m.racebets.com and start to place bets. With this, there are also no specific requirements that are needed for users of other devices outside of Android and iOS operating systems. There are some payment methods that players can use when depositing money into their Racebets account. These are Visa Cards, MasterCard, Skrill, Paypal, Neteller, Paysafe, and POLi. Racebets would also include bank transfer options for those who want to deposit the money straight from their bank accounts. For the fees, each option will have its corresponding fee based on the computation of the payment facility provider. The credit and debit card options (Visa and Mastercard) would charge a fee for depositing money into RaceBets. The respective credit card provider will determine the amount. Also, online payment facilities such as Neteller, Paypal, Skrill, and others would also have their fees per payment facility. It is up to you to contact your payment facility to know the fees that they charge when you deposit money into your Racebets account. Visa Debit and Credit Cards would have a minimum deposit limit of €10 per single transaction and a maximum deposit limit of €5,000 per single transaction. Mastercard Debit and Credit Cards would have a minimum deposit limit of €10 per single transaction and a maximum deposit limit of €5,000 per single transaction. Skrill online payment facility would have a minimum deposit limit of €10 per single transaction and a maximum deposit limit of €20,000 per single transaction. Neteller online payment facility would have a minimum deposit limit of €10 per single transaction and no maximum deposit limit. That means that you may deposit as much as for as you want in a single transaction with Racebets. Paypal online payment facility would have a minimum deposit limit of €10 per single transaction and a maximum deposit limit of €5,000 per single transaction. The PaySafe Prepaid Card would have a minimum deposit limit of €1 per single transaction and a maximum deposit limit of €1,000 per single transaction. POLi would have a minimum deposit limit of €10 per single transaction and a maximum deposit limit of €20,000 per single transaction. For the bank transfer option, the minimum deposit limit would be €5 per single transaction, and the maximum deposit limit would be €25,000 per single transaction. When it comes to racing apps wherein people can place bets on their favourite racehorses, greyhounds, and many more, Racebets is one of the best places to go. Racebets is a leading horse racing gaming application that allows players from 40 countries place bets on their selected racing contestants. With sophisticated and appealing features, players can bet over 200,000 different types of races in style. With streaming options and ante-post section, players will be able to have an excellent gaming experience. With its inception in the year 2005, Racebets has become one of the biggest bookmakers in the entire country of Germany. In 2012, Racebets gained full access to the horse racing markets of the UK and Ireland. It was a milestone for Racebets as these two markets are the biggest in Europe. From there, Racebets eventually became globally recognised and has become one of the leading gaming venues in the entire continent with its influence reaching some countries outside as well like the United States of America and Canada. Racebets was even able to spread their clientele to countries in Asia such as Singapore. Today, Racebets is now operating under a UK license and regulated by the Malta Gaming Authority. How can I claim the welcome bonus? You can only get the welcome bonus after you’ve made the first deposit and placed the minimum amount required in a bet. How do I place multiple bets? You can do this by using the Accumulation of Betslip in the race market. It is highlighted in orange. You can either choose normal closure or self-exclusion. The previous allows you to close your account and go back to it in the future. The following filters gambling options for those who want to control their bets. You need to contact the support team to do them. Look for the setting clog under your username. Once located, click on the display language and choose one among the several options. If you have complaints in using the app or the mobile version of the website, please contact the customer support. The Racebets mobile app deserves some praise and credit for being able to provide the customers with a good playing and betting experience that they can enjoy wherever they are. That being said, this app deserves a rating of 8.5 over 10. The whole point that there is no dedicated app for the online gambling platform already puts a minus on the initial score. However, the features, the options, the aesthetic appeal, and the overall appeal of the mobile version of the website made up for that one con as a whole. That is why the app still gets a good score despite not having a standalone app for mobile users. Let’s go through the pros and cons of the app. First, the mobile version of the website is aesthetically appealing. With it is signature green and yellow look, it is not too flashy, and neither is the colour combination painful to the eyes. As a whole, the warm colours and the combination works well for the website. Also, the options and the tabs are all appropriately arranged in the mobile version, so everything is quite easy to find. Concerning the options, the mobile site offers live streaming, head to head race updates, highlights, and many more. You can get all of these cool benefits on your phone quickly. Lastly, the bonuses are also lovely as there is a welcome bonus that allows you to get 100% of your initial deposit wherein the max bonus that you can get is £50. On the other hand, one big con would be that there is no dedicated app for the platform. Since everyone is already on mobile, it will be a bit hard for Racebets to compete with other betting platforms that have mobile apps. First of all, it is quite troublesome to have to load up the mobile website as redirecting to the webpage may take longer. With a mobile app, loading is almost instantaneous. It is also much easier for the customers to have a simple app that allows them to access their bets quickly instead of having to go all the way to the mobile website version of the platform. Comparing the pros and the cons, it can see that even though Racebets has one significant disadvantage, they were able to make up for it with their advantages. That is why Racebets is still one of the leading race betting platforms globally.